HMS Rodney was commissioned in September 1835 and formed part of the British Fleet assigned to patrol and guard British interests in the Mediterranean. It was during one of her tours and while berthed in Barcelona, Spain, that this case occurred. Its unfortunate results led to the drastic execution of Marine Private Thomas McSweeney. McSweeney was a young Irishman who had served on the ship since its earliest days. He was always known to have done his duty to the best. Serving on the same ship and being his immediate superior, was Lance Sergeant James T. Allen. The fact that Allen was English and a Protestant resulted that the two were incompatable. The sergeant would sneer at McSweeney for the smallest of excuses. On the evening of July 16th 1836, Sergeant Allen reported McSweeney to the Commander for being "Off Deck" when the ship's pinnace was being hoisted in. At the time, McSweeney was slinging his hammock in his billet in the Main Deck Quarter. Allen's was a poor reason for reporting him, which was the last straw for McSweeney as while doing extra duty for his offence, lost his temper and assaulted the sergeant. Allen was on the wharf facing the Rodney and McSweeney rushed from the gangway and pushed him into the waist while expressing his satisfaction for his actions. He was immediately placed under arrest and taken on board to Commander Scott. On the way he met Mr Brothers, the ship's Gunner, who told the Private that his crime was punishable by hanging. McSweeney replied that he was now satisfied and that they could do what they like to him. Commander Scott informed the prisoner of his position and he replied that he was ready to take any punishment which the service allowed. In the meantime, Sergeant Allen was conveyed to the Rodney and taken to the Sick-Bay. He was examined by the ship's surgeon, Mr Charles McArthur, who found him suffering from symptoms of violent concussion of the brain. At 12.15 pm on 21st July, Allen died from the injuries sustained. During February 1837, the prisoner was brought to Malta and on the 25th of the same month he was brought in front of a Court Marshall on HMS Revenge. Present on the Revenge were Sir Thomas Briggs GCMG, Rear Admiral of the White, Admiral Superintendent of Malta Dockyard and Second Officer in the Command of His Majesty's Ships in the Mediterranean; Rear Admiral the Honourable Duncombe Pleydell Bouverie, Captain of HMS Vanguard was appointed President. The members of the Court were Captains Samuel Jackson, CB; William Elliot, KCH, CB; William Fisher; Armat Lowry Long; the Right Hon. Henry John Chetwynd Talbot, Viscount Ingestre, CB and George Buchan Martin, CB, all Captains from vessels which were anchored in the Grand Harbour at the time. As at that time there was no prosecutor, as there would be today, the Judge Advocat, Mr William Henry Brown, obtained evidence by questioning witnesses on oath, as did the other members of the Court. That the said Thomas McSweeney when under the Sentry's charge on the Rodney's Gangway lying in Barcelona Roads, on the evening of the 16th of July last, did purposely and maliciously push Corporal James T. Allen (Lance Sergeant) of the Marines from Gangway into the waist on the Main Deck. The said Lance Sergeant Allen died on the 21st of July in consequences of the injuries received from the fall. The witnesses were then ordered to withdraw out of the court, except for Corporal John Robinson, who was sworn and examined. Robinson stated that Private McSweeney was doing extra guard duty at the ship's gangway. As Sergeant Allan approached, the accused ran up behind him and pushed him into the waist. He also added that there was no previous provocation between the deceased and the prisoner and that McSweeney was sober at the time. Robinson was then cross-examined by McSweeney. Corporal William Johnson and Private William Bains followed in giving evidence and stated similar to that said by Robinson. The next witness was Mr John Norris, Mate of HMS Rodney and Officer of the Watch at the time of the incident. He repeated the course of the ocurrence and the exchange of words between the prisoner and Mr Brothers, the Gunner. He also stated that Sergeant Allen was in the habit of swearing at McSweeney. The next witness was Lieutenant Roco Payne of the same ship, who recounted the 'Pinnace incident'. Mr Charles McArthur, the Rodney's Surgeon followed and tested in relation to the medical aspects of the case, describing the injuries sustained by the deceased and how they led to his death. The President informed the prisoner that the Prosecution was closed and called upon him for his Defence and any evidence he wished to produce on his own behalf. When requesting a little time to do so, the Court granted him until Monday morning, 27th February. On the Monday morning, a little after 9.00 am, the Court reassembled and McSweeney requested the Judge Advocate to read his Defence for him. "The Honourable Members of the Court Marshall. I most earnestly pray of you to take into consideration the state of my mind on being charged with maliciously pushing Sergeant Allen into the waist; and as you were graciously pleased to allow me until today to make my defence, I trust you will give credit to my statement. I was under sentry's charge for the Sergeant reporting me for doing necessary duty of slinging hammock at the time the Pinnace was being hosited in. The witnesses declared that there was no previous altercation between us; but at that moment in a fit of vexation for being reported for so slight a matter and his sneering at me as he passed me on Gangway "You bogtrotter, you are in for it now", I thought I would not let him do so for nothing so made a short run to catch hold of him, without even thinking he could possibly fall into the waist in consequence. And in my oath, I declare it was without the slightest intention or thought of taking his life. Resentment at the moment for what I thought hard and cruel treatment for so slight a cause was my only motive for so doing, but I never harboured or felt ill will towards the Sergeant, and I trust it will not be supposed that I could be desperately wicked as to which to take away the life of a fellow creature purely for reporting and calling me names. These I solemnly declare are the plain facts and by which I hope to convince you that I had no wish or design of taking away his life. With respect to the words it is said I used after the Sergeant fell, I also solemnly declare that I have no recollection of, as my mind is far from sound. If I did unfortunately say so it must have been for the vexation of the moment, as I had no idea that the man's life was in danger by the fall and have been truly sorry for the accident ever since, and have suffered a great deal in my mind all the time. I have been in confinement for the last six months. "In consequence of which .... the prisoner to be hanged by the neck until he is dead at the Yard Arm of such of His Majesty's Ships, and at such time as shall be decided by the Commander in Chief ..... "
It was ordered that the sentence was to be carried out on board HMS Rodney. By today's standards, the verdict appears to have been severe and it was questionable as to whether McSweeney had a fair trail even by the standards of the time. It is unlikely that McSweeney had intended to kill Allen and the Sergeant was very unfortunate to die considering that his fall was to the Main Deck, barely six feet below. It looks evident that McSweeney only intended to slightly injure Allen; but it was also unfortunate that the Act of 1749 which governed naval law made no provision for manslaughter. HMS Rodney entered the Grand Harbour at Malta on 5th June 1837. On the morning of June 8th, a tender-boat drew along HMS Ceylon, where the prisoner was being held and departed with McSweeney on board. It headed towards HMS Rodney which was anchored in the middle of the harbour opposite Senglea Point. The Rodney was in full view from the surrounding bastions, where large crowds had gathered. Surrounding her were HMS Caledonia, Asia, Vanguard, Russell, Rapid, Nautilus, the fire-boats Meder, Spitfire and Firefly and cutter Hint. Their crews were also mustered on decks to witness this execution. McSweeney boarded the Rodney assisted by members of the clergy which had been with him from the day the sentence was passed. The rigging of all the other ships were manned and perfect silence prevailed when Captain Parker read the Warrant. The condemned man was standing on a platform rigged over the hammock netting under the fore-yard. The common hangman, Michele Prestigiacono, had adjusted the noose around his neck. The rope was reeved throught he block attached to the yard-arm and was in the hands of a number of Marines on deck, along with two seamen from each ship, waiting for the signal. As soon as the Warrant was read, a gun fired and the wretched men was launched into eternity. His body ran quickly up the yard-arm to a height of 60 to 70 feet. Death was instant. After hanging for half an hour, the body was lowered down and conveyed by boat to Tas-Salvatur' chapel. A mass was said for his soul and his body was taken to the cemetery of St. Lawrence, Vittoriosa. The procession was made up of local people and was reported to be a most moving sight. 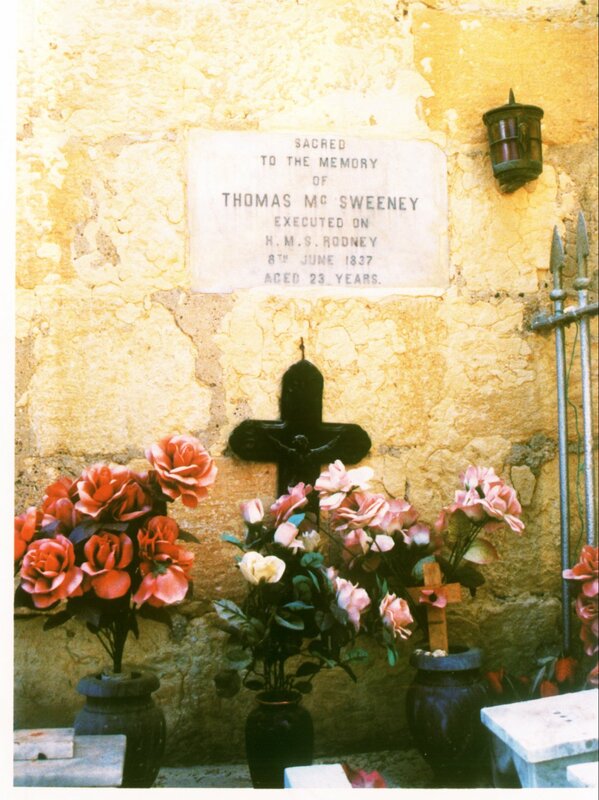 The grave was well kept and tended by the local people as the news of the Court Marshall and McSweeney's fate brought about a great deal of sympathy from the Maltese community. McSweeney's ghost was said to have been seen near his grave and over the years a strong McSweeney cult developed and money was provided for oil and candles that were always alight on his grave. Candles and flowers are still placed on his grave, by a few. Royal Marines Museum, Arch 15/2/8(9). 'Dizionario Enciclopedico', Malta National Library. 'Marine McSweeney - Long Remembered' by Colonel K.N. Wilkins, OBE and Lt-Col. S. Pope, RM. 'A Corner of Some Foreign Field', Major A.G. Harfield, The Military Chest, Vol.4 No.1 1985. The complete article can be found in 'Monument - Forum on the National Heritage of Malta' Issue no.3 July 1989. The article and photograph appear by permission of Denis Darmanin.